I love dim sum, and everything about it. You might have already known this if you have been following me for some time. There is something to be said about steamed or pan seared dumplings that are tender on the exterior and have a wonderful surprise on the inside. I’ve also said that Milwaukee needs a dim sum palace. It desperately does. Now if you have never had dim sum, it is a basically a restaurant that carts around an array of steamed items including things as steamed buns, great vegetables, and things like Shaomai to name only a few. Did I mention delicious chicken feet as well? Now I used a pot sticker maker for mine, but this was the first attempt at using it (I recommend it), but I’ve been making these for years simply by hand. Lay out a wrapper, and add about one tablespoon of the corned beef hash in the middle of the wrapper. Dip your finger into the water, and rub the perimeter of the wrapper with your finger. Fold over, and pinch the edges of the dumpling together, sealing the insides. 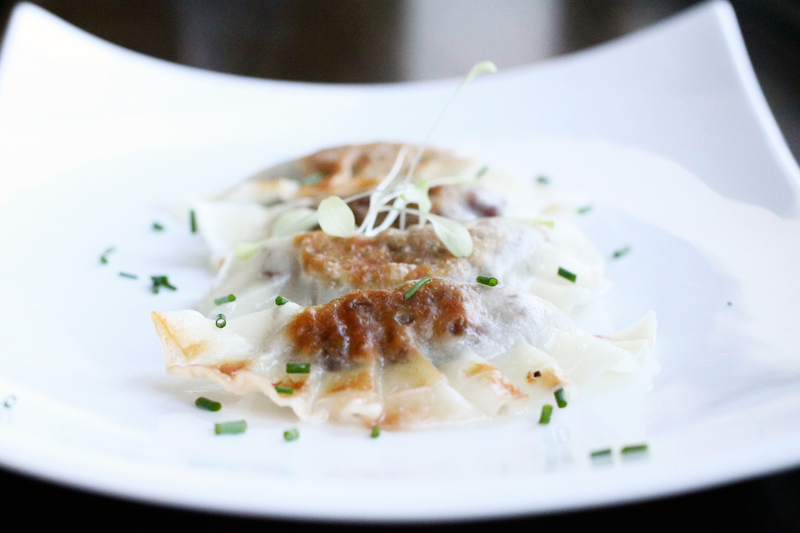 Set aside and repeat with however many pot stickers you would like to make. Add a large skillet to your stove and bring it to medium heat. Add in the oil. When the oil is hot, add in the dumplings. They can be added close together and a bit packed in if you desire. Cook the pot sticker until it is a golden brown on the bottom. Once browned, flip them over, and then add in the water. Add in about 1/2 cup of water, or enough to have the dumplings about 1/4 submerged. Turn up the heat to a medium-high, cover, and let cook until the water has evaporated. This should only take a couple of minutes. When you are ready to serve, carefully remove them with a slotted spoon, placing them on a serving dish. Garnish and serve. 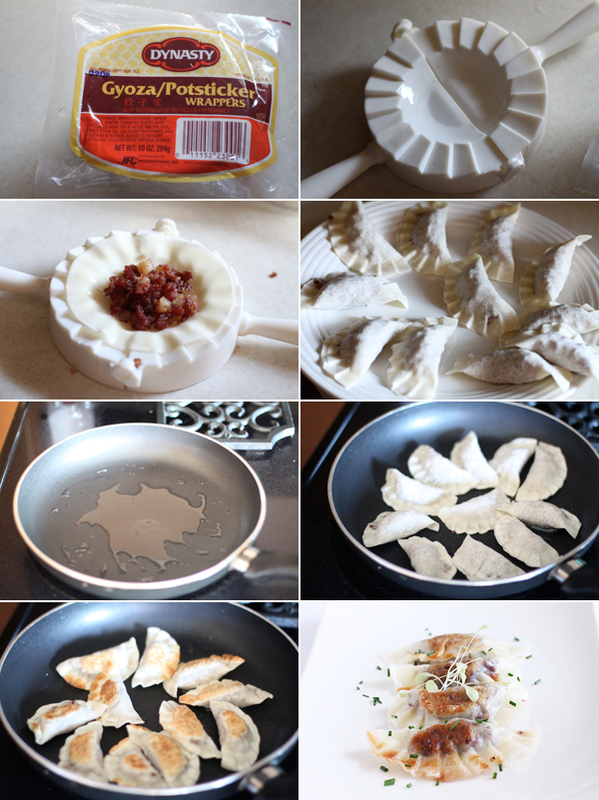 Now I used a pot sticker maker for mine, but this was the first attempt at using it (I recommend it), but I've been making these for years simply by hand. Add in about ½ cup of water, or enough to have the dumplings about ¼ submerged. Turn up the heat to a medium-high, cover, and let cook until the water has evaporated. This should only take a couple of minutes. Yummy, try potstickers with leftover brisket and dip in bbq sauce. Great idea tealeaf. Unfortunately I never have leftover brisket, however next time I make it, I will safe some and go for it. Oh wow. I wish I’d thought of that. What about a mustardy vinaigrette type dipping sauce? Emulsified, with a little honey and rice wine or apple cider vinegar? christine, you know as I was eating these pot stickers, I was thinking of a sauce, as I do love a good dipping sauce on traditional ones. Your idea sounds great.